50-80% of all women experience nausea and vomiting in early pregnancy (NVP). NVP has a detrimental impact on women’s quality of life (QoL), especially their ability to work.Despite the fact that a number of therapeutic interventions exist to alleviate symptoms – ranging from pharmaceutical products to natural therapies – women remain reluctant to take medications during pregnancy, and a safe, effec-tive and acceptable treatment for NVP is still to be found. 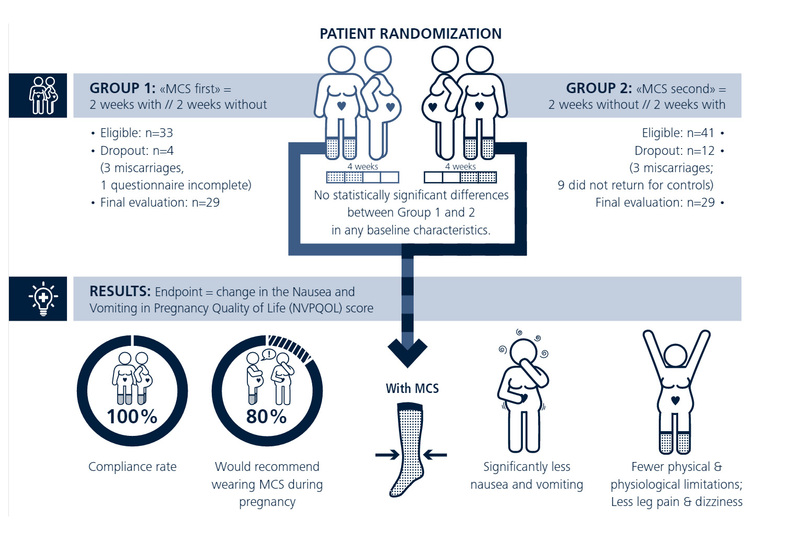 The aim of this study was to evaluate the effect of medi-cal compression stockings (MCS) on symptoms of nausea, vomiting and dizziness between 8 and 16 weeks of preg-nancy, and their impact on QoL factors. Pregnant women >18 years and with mild to moderate NVP were eligible to participate. A total of 74 women were enrolled in the study. 58 women completed the study and were included in the analysis set. Wearing compression stockings in early pregnancy improves not only nausea and vomiting-associated symptoms, but also QoL factors such as dizziness, leg pain and physical/physi-ological limitations. Compression stockings could be a non-phar-maceutical instrument to alleviate nausea and vomiting symptoms during early pregnancy. Previous Previous post: Comfort and fit in footwear – too loose, too tight, and just right! Next Next post: Foot Care as We Party!